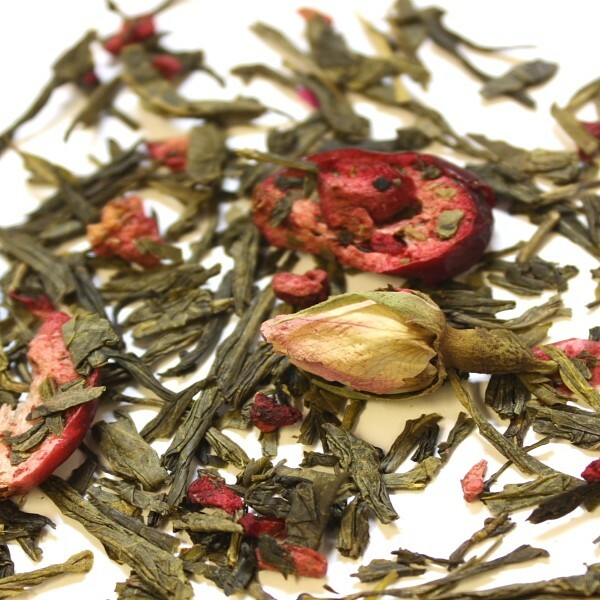 Sencha green tea delicately flavored with delicate rosebuds, fresh cranberries and sweet raspberries. An enchanting rhythm of flavors. Delectable both hot and cold. Try some with white crystal sugar. Indulge your taste buds. This green tea blend is FABULOUS! Cranberries aren’t really my favorite fruit, but I really love how they enhance this blend. The flavor is sweet, a little tart, floral, and berry-licious! The first thing you’ll notice when you open a package of this tea is how beautiful it is. HUGE, whole pink rosebuds, little bits of dried raspberry and dried cranberry halves with long, elegant spears of Sencha green tea. And it smells just as lovely as it looks! Lightly floral, sweet, and fruity! But, it really wouldn’t matter how beautiful the tea looks or smells if it didn’t taste good – this one DOES. The green Sencha is fresh and has a light, creamy buttery taste to it. The grassy tones are faint. There is no bitterness, and only a very slight astringency to this – it is very pleasant and relaxing to sip. The added flavors of this tea are a little lighter than the green tea flavor, but all of the flavor components co-exist in perfect harmony. The cranberry is lightly sweet with a nice, tart, cranberry taste that lingers long after the sip. It’s quite delicious! The raspberry offers a pleasing sweetness that curbs some of the tarty flavors of the cranberry just enough so that it isn’t pucker-y. The rose flavor is very soft, but distinctive. It adds a nice contrast to the berries. This is a WINNER from Praise tea!